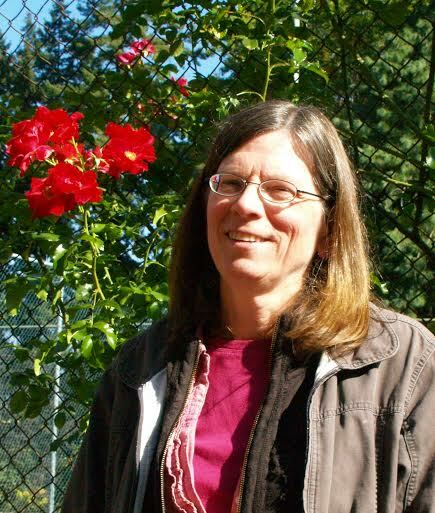 Judy Beaston lives in northwest Oregon where the weather and people suit her muse. She enjoys the challenge of flash fiction, weaving layers of experience between and behind the story told. Her flash stories have appeared at WritersType, WOW-Women on Writing and The Writers' Mill Journal. My good friend, Willa, has cancer. It's an aggressive invader. Her doctor told her to plan on weeks, not months, before the cancer owns her organs. "She's not dead yet," my therapist tells me. "There'll be plenty of time for grieving later. For now, she's here. Listen to her. Talk with her." I want to, but my phone calls and emails go unanswered. She also stopped participating in our Internet poetry group. When I contact her sister, she tells me Willa gets my messages but has too little energy to respond. My other problem: she lives a full day's drive away and I have a job. I need an alternate way to remain connected. "That's me and my brother's dog, Casey," I write beneath the image, my first phone selfie. "She sends you doggie kisses." And I'm sending tears I want to add, but I know that means I'm grieving her being gone. She's still here. "Casey's beautiful," she texts in response. "But where are you?" It's true. Only Casey is visible in the photo. My tear-streaked face is buried in his fur. It's a wonder the photo came out at all. "Sunset. The colors remind me of that scarf you wore at our Poets' Picnic." I'm missing you so much already I want to add in large letters. But, of course I don't. What I want is to be sitting on her deck watching the sunset together, sharing poetry and listening to tales of her escapades at Berkeley. I loved those stories. She was a law student then but studied the philosophy of living a full life with equal intensity. Jazz clubs, coffee houses and impromptu road trips to San Francisco or Seattle wove an eclectic path through her college years. I miss her energy. Her silence weaves shadows through sunny days. But I won't grieve yet. She's still alive and soon I'll get some time off work. "Bard Selfie! To Be or Not To Be," I write in my note accompanying a photo of Shakespeare. "But I think today's question is: To Selfie or Not to Selfie. Sending hugs." Tears blur the image on my phone. I need those hugs, too. The hours fly by. Too fast. I fear she'll not live through the end of next week. That's the soonest I could arrange time away from the office. It's fitting, too. Fridays were our day for sharing our newest poems. Do I have a new poem to share with her? "This is me in front of my car. Ooops! Got my car in front of me! Hey, I'll be there in a few days, ready or not!" Hide and seek. We played it when we were kids, in our together times before college and jobs split us apart. "Stay home," she texts. "I've changed. My body's failed me." Her words remind me of a poem she wrote during her mother's final weeks. I text back: "It's your heart and soul that I love. I want to be with you. Please say it's okay to visit." "See that paw and big pink nose? Mitzi took this one herself. Kitty selfie! She's purring. Best love there is, right?" And I'll be there soon, I silently add. Please wait. Not sending this one. It's me; tears streaming down my face. "How's your friend?" My therapist inquires at our next session. "She has black days and gray days. Not much sun." I nod. "She told me to stay home, but I'm going anyway." "This is us at Java Joe's. You're the good-looking lady in the chair by the no-whip Mocha. I'm the funny monkey with the caramel Macchiato." But there are no real humans in the photo, just photo-shopped images I hope will make her laugh or at least smile. She loved this place. When she visited me last year, every day included a stop at Java Joe's. Two days until I'm with Willa. Waiting is agony. My car's already packed. Willa's sister cried when I phoned to let her know about my plan. "Hurry," she said. "Willa needs you here." "Route 70, Mile Post 12. Yep, your city limits. Wish you were here!" Willa's bed is our backdrop for this one. She's on the right, closest to the IV drip and table with its jumble of medicine containers. I'm scrunched up next to her. She's smiling, sort of. I'm fighting off tears; but at least this photo isn't blurry. Willa's sister and I have our arms around Willa, the lady in purple pajamas with that audacious red feathery boa draped across her shoulders. I love that we're all smiling. Willa's memorial service. I need three photos to capture the large gathering. "That's me on the left." I stare at the image. Tears roll free as I hand the phone to my therapist. "Willa's in the bronze urn on the right." "I'm sorry for your loss," he says. "Me, too, but I'm glad I listened to my heart and not her words." "Tell me about that experience." "Here, let me show you. I have more selfies."